You can use the same event handler for more than one control by specifying the handler for each control and pointing to the same event handler code. In the example below, we have three buttons, each of which wires up a handler for the Click event, but using the same handler (Button_Click). 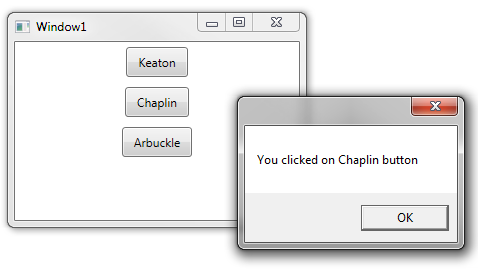 <Button Content="Keaton" HorizontalAlignment="Center" Padding="10,5" Margin="5"
<Button Content="Chaplin" HorizontalAlignment="Center" Padding="10,5" Margin="5"
<Button Content="Arbuckle" HorizontalAlignment="Center" Padding="10,5" Margin="5"
In the Button_Click event handler, we can check the Source property of the RoutedEventArgs parameter to determine which button sent us the event. Mohan, you could either have a handler on the window that owns the control invoke a method in App.xaml.cs or you could wire up the handlers in your code, from App.xaml.cs. Depending on what you’re doing, however, data binding is a better solution than wiring up handlers.